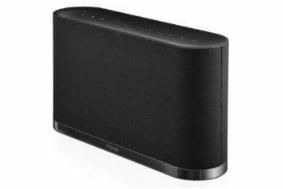 CES 2011: iHome iW1AirPlay speaker to go on sale in UK Q2 for £299 | What Hi-Fi? Due on sale in the UK during Q2 this year for £299, the iW1 is a one-piece active speaker system that streams music, metadata and album art from iTunes or your Apple portable via AirPlay using a wi-fi or ethernet connection. Your music library can be controlled from a wi-fi equipped iPhone, iPod Touch or iPad. The iHome iW1 also comes with a standalone iPod/iPhone dock that connects using a standard USB cable. Other features include a capacitive-touch control panel, an integrated handle in the back, and the brand's Bongiovi Acoustics DSP signal processing with Class D amplification.